Personal protective equipment makes the workplace safe. If you are working or walking on elevated surfaces, you should always wear a safety harness. This equipment is the most common type of personal protective equipment (PPE) used to keep people from falling from dangerous heights. A safety harness with shock absorbing lanyard is easy to use. Its purpose is to reduce the amount of force felt during a fall. Organisations are required to provide their employees with appropriate PPE to avoid injury or fatal accidents from happening. 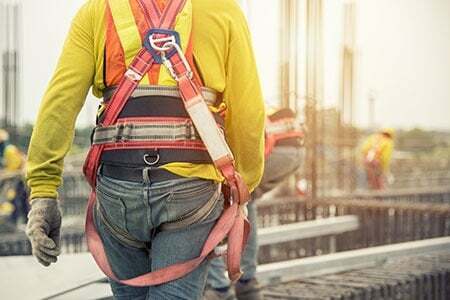 What is a Safety Harness with Shock Absorbing Lanyard? A shock absorbing lanyard is an important element of a personal fall arrest system. It can absorb forces on the body of up to 408 kilograms. Lanyards are available forup to a maximum of 1.8 metres and have different hook configurations. When using a lanyard it is important to determine the potential fall distance. That way you can prevent contact with the lower surface. The lower surface can be an obstruction beneath the working area, a lower floor, or the ground. Webbing – The webbing of the lanyard must be able to withstand tough conditions that include rough use and exposure to different types of weather. Single or Double Leg – Some job sites require workers to have 100 percent tie-off capabilities. For those instances, you need a double leg lanyard. Single leg lanyards are lighter and allow more movement. Impact Indicators – A safety harness with shock absorbing lanyard comes with impact indicators that will allow you to determine if it was already involved in a fall. Length – The standard length of lanyards is 1.8 metres or 6 feet, but there are adjustable, shorter or longer ones available on the market. Hooks and Connectors – Lanyards come with different hooks and connectors. Some of the common hooks are snap hooks, rebar hooks, and tieback carabineers, just to name a few. You can lower the risk of potential injury or even death by having the right safety harness during fall arrest. If you need a new safety harness or other working at height solutions, contact us today! At All About Lifting & Safety we can provide you with more information about the best PPE to fit your needs.